Have you found yourself staring at some produce at the grocery store, one row is organic and the other is not, unable to justify the added cost of the organic option? While I’m all for finding creative ways to buy better quality foods, sometimes you’ve got to understand the distinct value of why organic costs more. It’s why I make a point to prioritize buying certain items organic at the grocery store because I know the value and added nutrition behind the higher price tag. Unfortunately, many don’t seem to know exactly why eating organic is important and so I sat down with a worldwide expert on this topic who shares his deep respect for supporting foods and farming techniques that offer you more nutrition and less exposure to toxic chemicals. Sure, organic is typically more expensive, but what you get for buying it is also far superior. You can’t simply compare the price tag and think that you’re getting more bang for your buck when purchasing conventional produce. To be clear, this interview is not meant as a judgment or condemnation should you truly be unable to afford organic right in this moment. That’s why I’m a big fan of prioritizing what I spend more on at the store (I share exactly how I do this in my book, The Savvy Gluten-Free Shopper). Strive towards organic and become savvy so that you can shift your budget towards foods that are better for your health. Jennifer Fugo: Welcome back to the Gluten Free School Podcast. I’m your host, Jennifer Fugo. And today, we are going to talk about the reality of pesticides found in food. Now, you might care about this and you might not. You might feel like this topic is overwhelming and you don’t fully understand what’s wrong with pesticides. I mean, you eat a peach, for example. You wash it off, you eat it, it tastes great. There can’t be any pesticides in there, right? Well, unfortunately, that’s not quite true. I asked a really interesting gentleman who’s wrote this amazing book called The Mystery of Safe Pesticides. His name is André Leu. He’s going to join us today and talk about the myths and realities of safe pesticides and is there anything that’s really safe about them. Now, Mr. Leu is the president of IFOAM Organics International, the world umbrella body for the organic sector. IFOAM has had around 800 member organizations in 120 countries and has a goal of the worldwide adoption of ecologically, socially and economically sound systems that are based on the principles of organic agriculture. 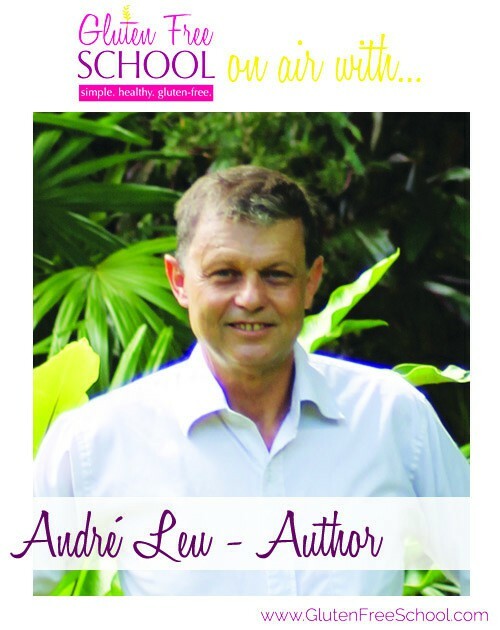 André has over 40 years of experience in all areas of organic agriculture from growing, pest control, weed management, marketing, post-harvest, transport, grower organizations, developing new crops and education in many other countries. He has extensive knowledge of farming and environmental systems across Asia, Europe, the Americas and Africa from almost 40 years of visiting and working in these countries. He has written and published extensively in magazines, newspapers, journals, conference proceedings, newsletters, websites and other media all on the area of organic agriculture including climate change, the environment, agronomy and the health benefits of organic farming. André and his wife, Julia Rohn, their own organic, tropical fruit orchard in Daintree, Queensland, which is in the northern corner of Australia. Welcome André to the podcast! André Leu: Thank you, Jennifer. Jennifer: Why don’t you tell us how you got interested in this whole organic farming business? André: Okay. I come from a family farming. When I was a child, I was always the one who would get chronic asthma from exposure to pesticides. Even just going into a silo where the wheat was stored or where I’d visit the shed and just the smell of it, I would become seriously ill. So, I always going to be an organic farmer. The only way I could farm was without pesticides. Jennifer: How did that turn into you now having written a book and being the president of an international organization? André: Okay. Two different questions. Maybe I’ll just start with how I became president because I still wake up in the morning and scratch my head to wonder how someone from, really, a very remote area of the world (actually, a remote area of my country) becomes into a national president. It’s actually a huge honor for me because I was really drafted or selected. People wanted me to run. I got elected to the board. And very quickly, in three years, I was president because of the members. I’m very humbled and honored that the members of our organizations want me to be our president. Then the other one, why I wrote the book, is I live in a farming area. The rise of cancers (particularly cancers of the sexual tissues like breast cancer and prostrate and ovarian cancer), all these types of cancers is just astronomical here. Then we look at particularly at the diseases that we see in children like the autism spectrum disorders, ADHD, all these sorts of issue. I started to wonder are these by pesticides. We’re told by the experts, the regulatory authorities, “No, this isn’t the case because that’s scientifically tested.” So I went and start studying the science and I found that, first, they aren’t properly scientifically tested. That’s a myth. And there is a huge amount of evidence, hundreds and hundreds of published scientific studies linking these chemicals with a whole range of diseases that we’re suffering with in modern society. I think people don’t fully understand what pesticides are. Could you explain to us what exactly pesticides are? Are they still on the plants when they reach the market? Are they still on the plants when you wash them? André: I’m glad you used lettuce. Lettuce is an excellent example of this. Another reason I became an organic farmer was when I started to keep animals, particularly chickens and ducks, one of the first things you read is don’t feed them out of lettuce leaves because the pesticides on them will kill them. So then, I wanted to investigate it. Why is it that what is supposedly safe to put on our children’s sandwiches, we can’t feed to our livestock?” And when I looked at it, I found out there’s multiple pesticide residues. You cannot wash them off for two reasons. One is that when they’re sprayed, they use what are called ‘stickers’ to keep the pesticide on the lettuce. So when you water it, it doesn’t wash the pesticide off. Then there’s another group of pesticides that we call ‘systemic’. What happens is the whole plant absorbs it. Every cell has it, so that when the insect eats it, it does. Somehow, there’s enough toxin in it to kill the insect, but somehow, it’s supposed to be safe for us. The other thing I learnt is it’s just not one pesticide, it’s a cocktail. For any plant or any crop that’s approved, they don’t approve one pesticide. They’ll approve several insecticides (pesticides that kill insects), they’ll be fungicides, for instance, to kill fungus diseases, there’ll be herbicides that kill weeds. There will be a whole range of them. It’s actually a cocktail of small pesticides. And when I investigated, for instance, there is no testing of this cocktail of approved pesticides. The more I got into it and studied the science, the testing that is done is completely inadequate to protect human health. Jennifer: Why do you think it is that they’re telling people that they’re fine, that the pesticides are safe, that they’re okay, they’re not going to kill you? What is the reason why this isn’t being stressed to the public with a little more maybe pizzazz for lack of a better word? André: That’s a good question. I can understand why the companies are doing it, because they’re there to make money. So they want to sell their products. To give an example, for instance, one of the products, glyphosate (one of the common names for that is RoundUp), the main company that makes that earns more money than the gross national product of many countries. That’s how much it’s worth. But what I don’t understand is why the regulators allow this? There are hundreds and hundreds of studies I siphoned in the book, how many published scientific studies has shown the harm of the smallest level? And also, why they permit what I regard (and what most experts regard) as totally inadequate science. To give one example, for instance – or I’ll give you two examples. The first one is when they do the testing, they do it on what they call the ‘active ingredient’, which is the main compound. For instance, if I used glyphosate, the main, active product in RoundUp, they just test the glyphosate. But RoundUp is made of a whole mixture of different chemicals – adjuvants, activants, synergists. So glyphosate by itself hardly works as a pesticide. To make it work, they have to add these other compounds. But they don’t test. There’s no testing of RoundUp as a pesticide. We now have a lot of scientific studies on our site showing that RoundUp is far more toxic. We know it’s an endocrine disruptor. We now that it causes the changes to cells that makes them precancerous. We know that it causes breast cancer cells to multiply. So if somebody is in the beginning of the cells turning into cancerous breast cells, the smallest level of RoundUp will cause that cancer to multiply. And yet, that is all ignored by the regulatory authorities. And the other one, to get back to the letters, you’ve got a mixture. You’re going to have a pesticides like an organophosphate that will kill the caterpillars that ate it. You will have a fungicide that will kill the molds and fungus and you’ll have a herbicide like RoundUp that kills the weeds. You have all those residues in it, not just one pesticide. There is absolutely no testing of this cocktail. We have very good evidence now where there is testing that the synergistic effect – synergism is where instead of one and one making two, one and one could equal five. In some cases, one and one can equal a thousand. But we do have a lot of data showing that these things can be two or three, four hundred percent more dangerous than the single ingredient. Jennifer: I wanted to ask about the whole issue with babies. There has been several articles at least that I’ve seen over the last year that state very clearly and plainly that the pesticide load that the mother-to-be is exposed can be transferred to the fetus. Can you share with us any information about that because I know we have a lot of moms that are listening to this? Maybe they’re pregnant now or they’re thinking of getting pregnant or they have children and they want to have another baby. I think this is a really important topic especially for moms, so I’d love for you to speak to that. André: Jennifer, I’m really happy to speak to this because I believe this is the most important topic. As parents, I believe the most important things we can do in life is give our children the best start possible. When it comes to pesticides, the data is very concerning. In fact, I have a lot of information in the book on this because to me, this is probably the most important issue. The data now shows that children in developed countries now are exposed to pesticides before they are born. We know, for instance, just testing seminal fluid and ovarian fluid and the amniotic fluid, we do find pesticides in it. We know that the pesticides are crossing the placental barrier. We also know because of the work of endocrine disruption that amounts as low as parts per trillion can affect the fetus as they’re developing. They become what are called ‘endocrine disruptors’. At particular stages when the fetus is developing, they need very small amounts of hormones, for instance, in terms of sexual development, whether the baby is going to be a boy or a girl. It’s the smallest amount of testosterone or the smallest amount of estrogen is really important for the full development of the sexual organs, the sexual tissues and also, the whole sexual hormone system. This small amount to actually parts per trillion. To give the listeners the idea of what a part per trillion is, if I have three Olympic size swimming pool of water and if I put one drop of compound in it, that is a part per trillion. What we know now is that a lot of chemicals can actually work as artificial hormones. And particularly what we’re finding as these artificial influence. This, we know now is very important later in life in how the child would develop and particularly, related to this rise in cancers in sexual tissues. If we look at the rise of breast cancers, ovarian cancer, endometrial cancers in women and in men, testicular and prostrate cancers, we can trace it back to these small amounts of endocrine disruption. We also know that what happen is as the fetus develop, it gets this very small hormone signals that signal to Jane to develop limbs or develop endocrine disruptions, develop the nervous system (for instance, the brain). And what we’re seeing now (and there’s very good scientific literature) that small disruptions to that can lead to cancers, thyroid disorders, immune system problems. We have very good data. I’ve gone to that. For instance, one of the most common group of chemicals, the organophosphates, for instance, we’ll end up with children with lower IQs, attention deficit, hyperactive disorder or the autism spectrum disorder. I can say they’re increasing so rapidly. We see other things like lack of physical coordination, loss of temper, anger management issue, the whole issue of bipolar schizophrenia, spectrum of illnesses. Later in life, we see things like depression. There’s another issue in our gut, the whole issue of the digestive system problems we’re seeing, cardiovascular disease, reproductive problems as adults later in life and the other one we’re seeing here are deformities of the genital, urinary systems when children are born. And one of the big ones we’re looking at now is the change in our metabolic systems. We’re seeing this raise in childhood obesity and diabetes. This is because of this endocrine disruptions. Jennifer: I want to ask about the environmental consequences because even though we’re talking about food, I recognize that when farmers spray their crops, the herbicides and pesticides, they just don’t stay on the plants. They go into the soil. And that, with run-off, can end up in our water. Am I right about that? André: Exactly! And I give good data from the United States Geological Survey. For instance, virtually, every river system or water system tested in the U.S.A., you can find chemicals. The two widespread ones, which is Atrozine (which is one of the herbicides that’s everywhere) and the other one, like I mentioned, is glyphosate. That is found in most water systems. And also, because it evaporates from the field and goes into the air, most rainfall tested will have these chemicals in it as well. And because clouds travel, that rain falls. It doesn’t matter if that farm is a hundred miles away or further, those pesticides residues will travel and fall, go into the water and into the soil in other areas. Quite a very good study that was done by researchers at the University of Madison, Wisconsin. There, they looked at the levels of pesticides and fertilizer that are found in normal ground water, drinking water in the Midwest of the U.S.A. When they tested that, they found that – this is work done testing on rats. What they found is it significantly affected the fetus when the mother rates were drinking it and the babies were born with thyroid problems. They were born with a whole range of other physiological problems as a result of this small levels of pesticide in the normal drinking water. Jennifer: And that’s really scary to think that this isn’t just food. This is something we have to think about in terms of water, something that we all desperately need in order to survive. We’re literally contaminating the water tables around us all with these chemicals. I think that we would know more about it, but we don’t seem to know much about it. So what I want to ask you, we’ve set the stage for people to understand the basics, what can we as women and moms and fathers and sons and parents, what can we do in our daily life to start minimizing our exposure to some of these stuff. What do you suggest? André: It is very simple. And once again, we have good, scientific studies. Eat organic food. I have quite two excellent studies which tested children, tested the urine of children. And within four days of eating organic food, they could not find pesticide residues. It’s just quick as that. To me, people might say, “Organic food is more expensive,” but it’s more expensive not to have it when you consider the damage that you’re doing to your children. In terms of the way that you spend money, I believe that organic food is the best value. Children are too precious and too valuable not to feed them organic food and give them the best start in life as you can. Jennifer: And so in the U.S., there’s this interesting thing that’s happening where some farms will not get certified as organic because the red tape and the application and the fees are so expensive, but they do farm that way. Do you recommend to place that they could maybe go to a local farmer’s market and talk directly with the farmers to see how they’re farming, so when they make their purchasing decision, they could actually support a farm that maybe they aren’t certified organic, but they’re farming in a way that is organic? Does that make sense? André: I totally agree with this. The idea of certification is that if you are a long way away from the farmer, you have a credible third party that’s checked the system and you have a guarantee that what you’re buying is organic and you don’t have the chemicals on them. But if you know the farmer, then you could build that trust. So for instance, in the U.S.A., you have a lot of CSA’s, consumer supported agriculture. Well, if you now that farmer and you trust them, you don’t need certification. Similarly in farmer’s markets where they have some sort of guarantee or if you do know the farmer, then you don’t need certification. You could build that direct trust. Certification is more a case of if you walked into a shop and you’re buying a product where you don’t meet the farmer. You have to have some sort of credible guarantee that what you’re buying won’t have all these pesticides. Jennifer: And André, I have another question around this and the idea of products. What about meat? So for, say, cattle, we’ll see this trend with cow that they will feed cows massive amounts of corn and that corn is loaded with Bt toxins and all these other things because it’s not organic corn. So we’re talking about conventional beef that is sold in the store. Is it possible for us then, if I go to the store and buy this conventionally raised beef, am I also ingesting pesticides from that as well? André: Yeah. Look, it’s not just, for instance, the Bt toxins. I can say there’s a very good study that was done last year in Canada that looked at Canadian pregnant women just in the normal Canadian diet. Not only did they find the Bt toxin in the bloodstream, it was actually crossing the placental barrier into the baby. There’s very good work showing that the Bt toxin (which as I explained to the listeners, the Bt toxin is the pesticide that is put out by genetically modified corn), there’s very good scientific studies now showing that this Bt toxin is dangerous to people and it’s not safe like the regulators say. But the big concern is that we know it’s crossing the placental barrier. We also have very good studies showing that the animals that eat it are also being affected by it. There are problems with the meat. But there are other toxins, as well. For instance, there are chemicals that are put in to say, get rid of intestinal parasites, organophosphates and other toxic chemicals. And those residues are in the meat from factory farmed animals. There’s also very good science on the massive difference in the milk and meat from organic animals and in factory fed animals, particularly ones from grass-fed systems. There’s a huge difference in the types of fats that are much healthier ones. There are types of fats now that we know protect against the bad cholesterol, protect against heart disease and damage to the arteries as against the types of fats that are found in factory-farmed animals. Jennifer: I also wanted to add that toxins in the body tend to be stored in fat. That’s another reason, for those of you who may not know, this is another problem. When you eat – and we’ll just use beef again as the example, if you’re buying conventional beef. And again, if you’re not quite ready yet and you can’t afford to buy everything organic, we totally understand, but this is again food for thought. But the fat that is on that cut of meat, you want to trim it quite well because the toxins hide in the fat. That is one reason why when they say, “Well, you don’t want too much fat on this. You really want to cut it…” Well, in that case, yes. We absolutely want to, especially in the case of eating conventionally raised meat. So André, just any final thoughts on what anybody who’s listening and they feel motivated to start making some changes, what are a couple, just very simple things that they could do maybe when they go to the grocery store? Any thoughts you’d love to leave with them before we close? André: Look, to me, it’s very simple. Where possible – and I say, “Where possible” because I’m in the same situation here. I can’t always get foods organically. That’s the reality at the moment until the organic industry grows larger in size and it’s available everywhere. But where possible, get organic. Reduce the load. My advice to parents, particularly to mothers who are pregnant or families that are about to have a baby, do everything you can to minimize the pesticide load. And also, for young children. What we noticed is that young children do not have what we call ‘serum proteins’ that detoxify pesticides to the same level as adults. We also know too that the body burden is they actually end up with a higher percentage of pesticides in their bodies compared to what adults have. So for me, do everything you can to feed your children organic food, to reduce that pesticide load so that you can give them the best start in life that is possible. Our children are our future. To me, it’s not about money. It’s about giving our children the best we can. As parents, that’s our responsibility. Jennifer: Well, thank you so much for joining us. I really appreciate this. I will say, it was an overview, but I do think that for many who didn’t fully understand this conversation about why pesticides are not safe and the dangers of them, I think that this information at least will get the wheels turning, so that they can start questioning things and asking their grocer about different items they see in the store. And then, maybe, also, I love to shop at farmer’s markets. I talk directly with the farmers that I buy from. Ask them the questions that you need information on. The farm that I buy my produce from is not certified organic, but they grow organic food. That’s the method that they use. Thank you so much for joining us! I really appreciate it. André: It’s a pleasure, Jennifer. Any time! Jennifer: Stay in touch with André. He’s got an amazing book. It’s called The Myths of Safe Pesticides. I’ll certainly put a link below. He’s also on Facebook, LinkedIn and Twitter. And if you’d like to stay in touch with his organization, they do have a newsletter. You can visit him on the web at IFOAM.org. I will, again, put a link to all of these below, so that it’s easy for you to access. Remember to rate, subscribe and review this podcast. And then, head on over and leave a comment below on this post about your thoughts on pesticides. Do you specifically buy organic food? Are you aware of how dangerous some of the pesticides, herbicides, insecticides, et cetera are? Is it a concern? Or do you just not have that space to be able to even deal with it. I’d love to know the difference of what’s important to you right now in prioritizing your diet. Thank you guys so much for joining me. I look forward to seeing you the next time. Bye bye. This is a wake up call! We must die to our perception that FDA is going to protect us or the misconception that “our grandparents ate this way and lived a long life”! Now that we KNOW better, we DO better. We have to re-prioritize our spending, making good health more important than ANYthing! Thank you, Jennifer, for this fascinating interview, and thank you, Andre, for enlightening us on the dangers of pesticides! I will share this with everyone I know.